I just came home from my five-day trip around germany. In my baggage thousands (I am not Joking!) of pictures capturing the last days. To categorize some of them I have picked up a new testing ground for my photographic skills. Since about two weeks I am pretty engaged in panoramic photography. I can’t really tell you why, but I have never seriously tested this field between photographie and heavy after editing with photoshop. Anyway I have used my time in the Autostadt to shoot some pictures between 120° and 360°. I am not really satisfied with the results and will have to work on the lighting and sharpness of the overall results. Still I want to share some of them and recommend the book that got me started to work on this topic again. Is a wonderfull science center in the heart of Wolfsburg. I have seen mutliple technical discovery playgrounds but this one surely puts itself on the top of my list. Situated in a wonderful designed (even though badly build) structure by Zaha Hadid the museum is all about openness and close contact to the wonders of nature. Massive amounts of guides help you around the different areas and are surprisingly well informed about all the background information of the experiments. I know, that Wolfsburg is knowhere close to anything in germany, but if you happen to have to be their, please don’t miss this chance to go back to be a little boy (or girl). Attached is a small clip of my tour with Julia and some of our shooting pictures around the experiments. 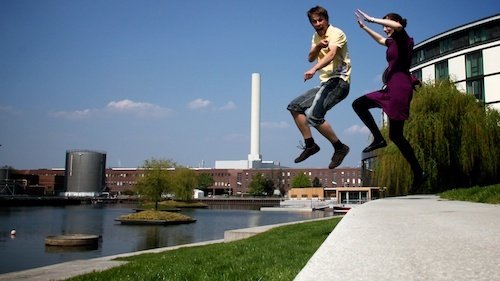 1,5h of sleep before catching the train at 5:17am// reunion with longingly missed friends// fascinating german car industrie// 759 pictures in 6 hours// Barbecue until late in the night ..
And the picture of Julia and me jumping between the Ritz Carlton and the VW plant. Pray that the german train system works technically. Pray that the german train system does not go on strike. Pray that the german train system works one time as it is written on my humangously expensive tickets. I do need you prayers! Happy Easter everybody!